Wash the rice and dry it on a bowl leave aside. Heat milk in a large pan. And add ghee, and then add milk. Now add the rice to the milk. Generally rice takes longer time to cook. You follow keep mixing every now and then and make sure it is not burnt in the bottom. And when the milk boiled then add little water whenever necessary. Now put in the sugar, bay leaf, salt when the rice is almost cooked and mix it very well, let milk mix boils the texture thickens slightly. And then add ½ teaspoon ghee, nuts, almonds, raisins, and cardamom. Remove from heat and add the rose water and mix well. Allow it to cool and refrigerate. When cool payesh, and then add fresh cream and ice cream. 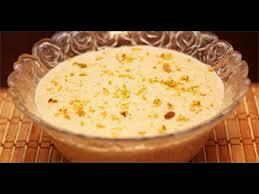 Finally serve this delicious payesh decorated bowl with fresh cream and ice cream.